A group campsite with ample camping space has been booked for Friday, Saturday and Sunday night. There is a fire pit and cook shack but only pit toilets. Showers are available in the general camp ground.. The CN station, also known as the ski chalet, at the park has been booked for Saturday, Sunday and Monday. It will be used for meals and if the weather is bad. It has a fridge, stove, microwave and flush toilets. Current plans are that supper Saturday, all three meals on Sunday and breakfast Monday will be provided. Note that breakfast may be up to you to make although there will be food avalable. Parking is just to the east. There will be lots of room for tents and RVs at the group camp site. There are two main areas at the group campsite and, if desired, the tents & RVs can be setup at the site furthest from the fire pit. Reservations are highly recommended as soon as possible as this is a long weekend. 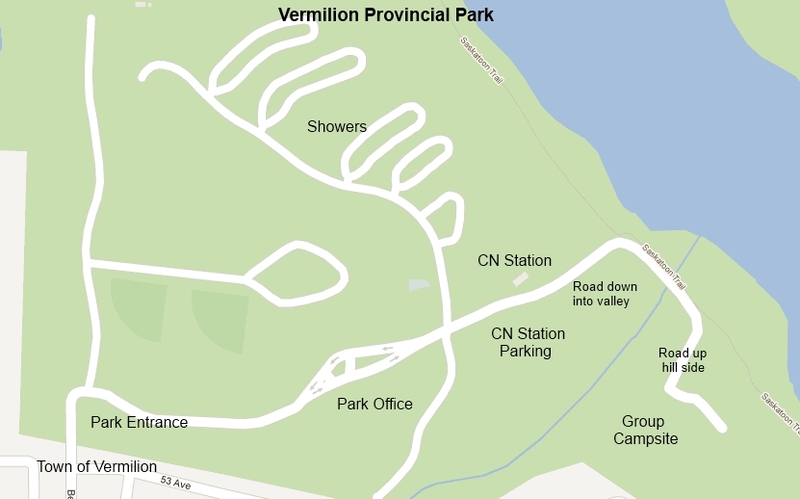 In the provincial park there are a number of kids playgrounds, wading pool, baseball diamonds, and miles of hiking and biking trails. There is an indoor swimming pool at Lakeland College. One family has stated that they're thinking of visiting the Royal Tyrell Museum which is about four hours drive mostly south and west of Vermilion at Drumheller.